Adding a lubricant to your machine parts is an essential part of caring for this mechanical machine. Usually, many people use a grease gun to complete this part. 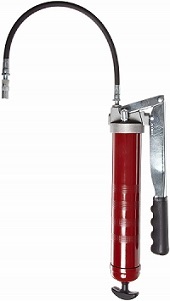 A quality grease gun will pump grease under pressure to a particular point efficiently without giving you any problems. A faulty gun will likewise help you with pumping grease, but it may not offer the same level of efficiency as the former. That is why it helps to go for the best products in the market when shopping for a grease gun. 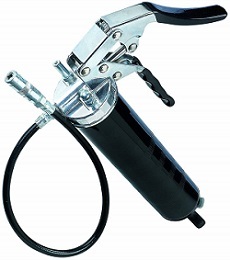 If you are looking for a quality product, get one among the top 10 best grease guns below. With any product on this list, you can be sure that you will get value for money. 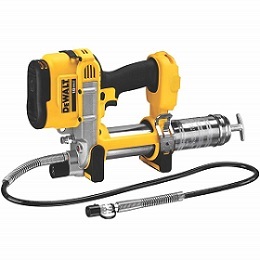 The DEWALT DCGG571M1 is one of the top 10 best grease guns on the market. This cordless gun by Dewalt features powerful motor that delivers up to 10,000 max pounds per square inch (psi), an innovative pump filter screen as well as a 42-inches long and flexible hose. It is also equipped with a series of bright LED lights to help with locating difficult-to-see grease fittings in low-light or dark conditions and a high-volume pump that can pump up to 5.0 oz. min of grease to a particular point in high-flow applications. Apart from the gun, there are also other items in the kit box. These include a fast charger, shoulder strap, and DEWALT 20V MAX XR Premium Li-Ion Battery (4.0 Ah). The benefits of this product include easy-to-use, durable, powerful motor, high volume pump, 20-volt battery, and each cartridge allows a bulk grease capacity of up to 14.5 oz. (maximum). There is only one setback to this product. The appliance is less comfortable to carry about while greasing even though it is fitted with a shoulder strap. Apart from that, everything else about the product is excellent. 500-E by Alemite is another quality grease gun that performs better than many grease guns out there. This gun delivers pressure up to 10,000 psi and is capable of providing 1 oz. of grease per 21 strokes with a 16 oz. 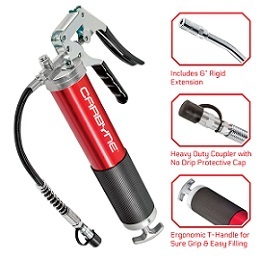 Cylinder capacity and a die-cast aluminum head for lightweight durability, as well as a vinyl cover on the lever for gripping, 500-E, is grease gun of its kind. Do not forget that it features a lever mechanism for standard volume output. The beauty of this gun is that it comes with fewer components and accessories compared to other guns yet it does a better job than many of them. You will like the fact that it is portable, lightweight and easy to use. You will also be impressed by the distinctive design of the Alemite 500-E grease gun, which strongly looks like a bicycle pump. However, the hose is not so long, which may make it unsuitable for applications requiring longer hoses. What is in the box? A grease gun, a loader fitting, a rigid extension, and a coupler. Manufactured by Lincoln Electric, this is arguably the best cordless grease gun you will ever find. 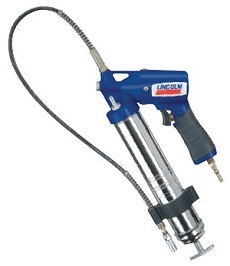 The Lincoln 1162 grease gun includes a 30-inches long high-pressure hose with coupler as well as attachment clip. The product is designed with a variable speed trigger, which ensures an excellent control of grease flow. It is fully automatic, and that means you do not have to operate it manually as is the case with many guns of this category. The variable-speed trigger provides excellent grease flow control even as the advanced pump design eliminates priming problems. 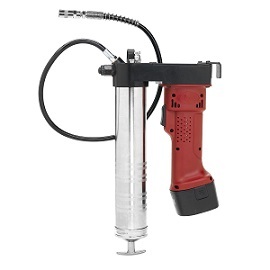 With a maximum grease pressure of 6,000 pounds per square inch and a pump ratio of 150 pounds per square inch, this device is the answer to your air grease gun needs. The Lincoln 1162 features air pressure ranging from 40 – 150 pounds psi. You will love the fact that this product comes with a one year warranty on parts and repair. It also offers the benefits we have seen in other top-rated guns, including easy-to-use, lightweight, portable and better performance. However, we did not see any setbacks to this gun. The Lumax LX-1152 Black Heavy Duty Deluxe pistol grease gun with 18″ flex hose is a quality product manufactured by Lumax. This deluxe grease pistol comes with a heavy-duty cast head that releases fluids with a pressure of up to 7,000 PSI. In addition, it is equipped with an air bleeder valve to vent air pockets, a follower rad lock to prevent accidental discharge and a hefty 18 gauge steel barrel from ensuring durability. Another thing is that this portable grease pistol features a three-way loading by using cartridge, grease or suction pump. This ensures more efficiency for your grease gun even as you try to minimize the possible wastages. Finally, the gun comes complete with an 18-inch flex hose, a hydraulic coupler with four hardened jaws, non-drip cap as well as ball check. The advantages of the Lumax LX-1152 Black Heavy Duty Deluxe Pistol grease gun are portability, usability, and performance. The one thing that is not worth liking about this gun is the length of the hose, which is too short. It can do better with a 30-inches long hose or so. 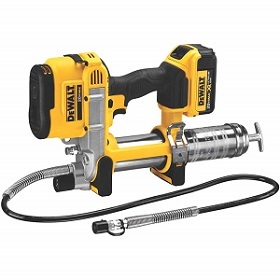 The DEWALT DCGG570B is a beautiful, yellow, portable grease gun produced by Dewalt Ltd. 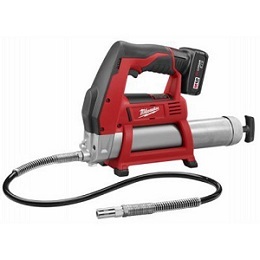 This cordless gun comes with a 42-inch extra-long, flexible hose, variable speed trigger, and a high volume pump. The pump can push up to 5.0 oz. min in high-flow applications. The device also comes with a powerful motor that delivers 9,000 max psi, which overcomes clogged grease fittings. It is also equipped with bright LED lighting for control and indicator purposes. Besides the distinct advantages of best grease guns such as performance, usability, and durability, this gun offers an extra-long and flexible hose. This presents it a suitable choice for applications requiring longer hoses. Also, the fact that it is so easy to set up that it takes only a couple of minutes to do so makes this gun appealing to many users. However, this gun is battery powered and the battery is sold separately. In our opinion, this should have been an electric grease gun, taking into account a product of this caliber. This could have been the best electric gun in our opinion. Lincoln Electric is one of the leading manufacturers of some of the best grease guns out there. But make no mistake, the Lincoln Lubrication 1134 heavy duty pistol grip grease gun with a whip hose, and a rigid pipe is not one of their products. Instead, this gun is manufactured by a company called Drake Off Road. 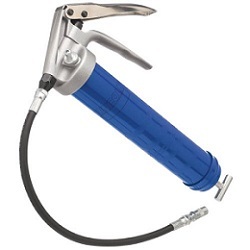 This heavy duty pistol grip grease gun comes with a rugged cast pump head complete with a quality whip hose for strength and durability, a precision fit and hardened plunger for preventing lubricant bypass, and resisting scoring for longer life as well as a tools extra-heavy follower spring for ensuring positive priming and uninterrupted pumping action. In addition, it features an easy check valve for easy cleaning without having to disassemble the gun disassembly and a tools jam-proof toggle mechanism for preventing accidental bending of plunger or binding in general. This product is durable, easy to carry around and does not take too much effort to clean. Actually, you can effectively clean your gun without having to disassemble it, thanks to the accessible check valve. The only setback to this gun is that it comes with a shorter hose, which can be a bit limiting in specific applications. The Astro 101 Mini by Astro Pneumatic Tool is a unique grease gun in terms of design. This silver, portable grease gun with a needle nozzle looks like something else rather than a traditional grease gun. But do not be fooled by the look, the gun lubricates effectively and holds up to 3 oz of lubricant. 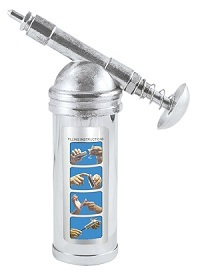 You can operate it with a single hand, and the gun comes with an easy-to-handle needle nozzle. Its overall weight is just 1 lb, which is much less compared to the weights of other guns in this category. Nevertheless, there are many reasons why we liked this product, which is one of the best cordless grease guns. First, it does require a battery as it is manually operated and that means you get to save on battery or energy costs. Second, it features a lightweight frame, which is not heavy to hold and does not put a strain on the user. Third, portable design with compact dimensions, which enable the tool to fit in a toolbox and carry around with ease. However, cleaning up the gun and changing oil takes more time. The Carbyne heavy duty professional quality pistol grip grease gun by Carbyne looks sophisticated in terms of design, but it is one of the best and easiest-to-use guns for pumping grease. The 4500 psi gun comes with a die-cast head complete with a 12-inch Flex hose and spring guard, as well as a heavy duty pistol grip handle and an anodized aluminum barrel. It also includes a heavy-duty air bleeder valve to instantly eliminate air pockets, 6-inch rigid extension, and non-slip rubber grip. Each feature plays an important role to ensure that the gun works smoothly and seamlessly. Nonetheless, the Carbyne 4500 psi grease gun offers a long list of advantages. These include higher fluid pressure of up to 4500 psi, professional quality parts, and an active air bleeder that eliminates air pockets instantly. Other benefits include ergonomic t-handle, which offers a proper, comfortable and safe grip and light in weight. What we did not like is the short hose for this gun though. The 2446-21XC M12 by Milwaukee is an easy-to-use and durable grease gun that offers value for money. This gun features a heavy-duty 12-volt motor that delivers over 8,000 PSI max operating pressure and discharges up to seven cartridges per charge. Its ergonomic design comprising a superior handle with a good, comfortable and safe grip makes the device easy, comfy and safe to operate. The 14-inches long hose is completed with integrated hose storage to make it easy for you to store your hose. Finally, this top-rated grease gun is equipped with an innovative LED fuel gauge, which adds user convenience and ensures less downtime. Besides the gun, other items in the kit include a 30-minute charger for your gun, an M12 XC battery pack, and a few other minor accessories. The Milwaukee 2446-21XC M12 is lightweight, efficient, portable and easy to use. Its only setback is the 14-inches long hose, which is not long enough. A grease gun of this caliber would do much better with a 30-inches and above long hose. The Workforce MEGA POWER grease gun by Legacy winds down our list of the top 10 best grease guns on the market. This powerful gun delivers up to 8000 psi, maximum operating pressure and does not require pumping during operation. It also features a 30-inches long hose and grease cartridge that holds up to 14 oz of oil. Besides the gun, the kit includes a 1-hour quick charger, two 12V batteries, an L1380 shoulder strap as well as a flexible extension for the hose. This gun is easy-to-use, portable, comfortable and above all quite powerful. It also comes with an adequate hose length that can be practical in all applications. Unlike other guns, we did not see anything not to like about the Workforce MEGA POWER grease gun by Legacy. Here are the factors to consider when shopping for the best grease gun. 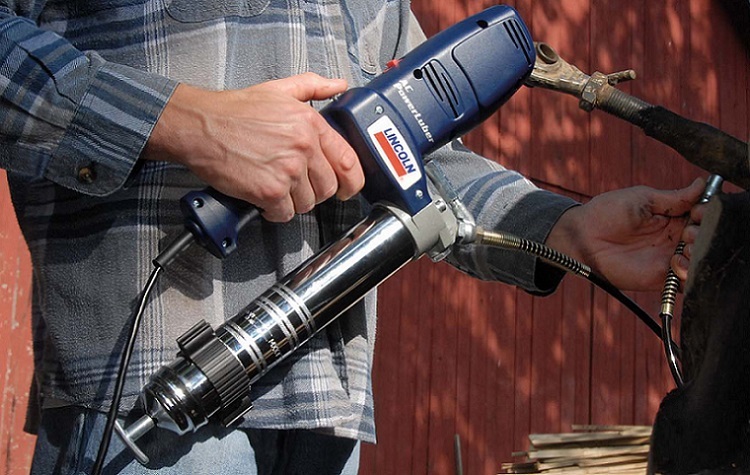 Cordless grease guns come with varying hose lengths, ranging from 10-inches to over 40-inches. A good gun should comprise a hose that is at least 30-inches long to be practical in certain applications where a longer hose is necessary. Grease guns are designed to deliver varying amounts when it comes to maximum operating pressure. A gun that can deliver a higher fluid pressure will never disappoint you in any application. The same cannot be said for one that provides a lower maximum psi. Consider the grip of the gun, making sure it is ergonomic and offers proper, comfortable as well as safe grip. Some guns provide nothing close to that. Never settle for one unless you want to have a hard time operating your gun. Usability and the ease of cleaning as well as replacing grease is another important consideration when shopping for the best grease gun. A good rule is to look for a gun with a set of features that make it easy to operate and care for. Here is where you should pay attention to things like a heavy-duty air bleeder valve to instantly eliminate air pockets, and so on. Choose a gun with a portable design and compact dimensions that can fit in a toolbox and be carried around with ease. Q: What is the best option between a manual, a battery-powered and an electric grease gun? Ans: There is no best option between the three types of grease guns as each type of gun has its own list of advantages and disadvantages. For example, manual or battery-powered guns lack a cord, and hence they are more portable and easy to carry around compared to their electric counterparts with a cord. Electric guns, on the other hand, have a more powerful matter and therefore can work better than different types of grease guns. Q: Can I use my grease gun for pumping other fluids apart from grease? Ans: Absolutely not! These guns are built strictly for the purpose of pumping grease. Using your gun to pump other fluids will definitely destroy it. Q: Can I replace the hose of my grease gun, which is short, with a longer one? Ans: Yes of course! You can get a longer hose for the gun if its original hose is not long enough to help with certain applications. Q: How should I store my gun after use? Ans: Make sure your gun is unpressurized before storing in a clean, cool, dry area and in a horizontal position to help keep the oil from bleeding out of the grease. Make sure to cover the coupler to avoid dirt and contaminants. You can use a grease gun clamp to store your gun in an easy and organized manner. Q: Can I use any grease with my gun? Ans: Never! Do not use any grease other than that which is specified by the manufacturer. Otherwise, using improper grease will definitely damage your device. Grease guns are not only an essential tool for industrial purposes. But these guns can also be used at home for the purposes of lubricating domestic appliances such as farm and garage tools. So, in case you thought that these devices are only relevant to industry professionals, it is time you changed that school of thought and got yourself one of these top 10 best cordless grease guns. After all, you do have some machine parts at home, which require regular lubrication, don’t you? A quality grease gun such as any of the above will help you with that quite effectively.